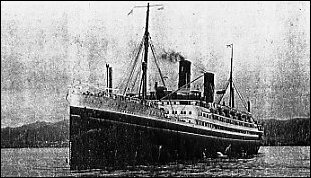 The Aorangi was a modest 600-foot passenger liner built in 1924 by the Union Steamship Co. of New Zealand for service between Canada and Australia. But she went into service in troubled times for the world, and consequently got caught up in the midst of the worst hours of World War II. Even though this vessel was utilized as a troop ship, a supply ship, a hospital ship and even an escape vehicle for hundreds of civilians fleeing the war, the Aorangi miraculously emerged from the war unscathed and met its end in a scrap yard. The vessel’s early years were spent doing exactly what she was designed to do. She made regular trips from Vancouver, British Columbia to Sydney, Australia, with stops at Honolulu, Suva, Auckland and Wellington. The Aorangi boasted accommodations for 440 first class, 300 second class and 230 third class passengers. She had a typical liner’s profile with two masts and two funnels. She was powered by four propellers and reached a speed of 18.5 knots. World civil unrest brought the liner in peril beginning in October, 1940, when it was utilized to send troops from New Zealand to Fiji. Then, in the summer of 1941, with the war raging in Europe, Aorangi was requisitioned by the British Ministry of War Transport and steamed from Sydney to the United Kingdom for war duty. After conversion for service as a troop ship, she joined a convoy of large liners carrying troops and supplies for the near east. She carried troops to India, the Middle East and also brought US and Canadian troops to Europe during the war, always escaping the terror of the German U-Boats and bombers from the sky. In January, 1942, when the Japanese invasion of Malaya was occurring, Aorangi was sent to Singapore which was already under heavy attack by Japanese aircraft. The liner successfully got into Singapore harbor and escaped with her decks laden with hundreds of women and children, carrying them successfully to safety in Australia. During the Normandy Invasion, Aorangi was there as well. She was by then serving as a depot ship for a fleet of about 150 tugs and auxiliary ships, supplying them with food, water, ammunition, engine parts and relief crews. She also served as a hospital ship and provided medical supplies. From D-Day, which occurred on June 6, 1944, until the end of July, the Aorangi serviced 1,200 vessels and countless other small craft. Her hospital took in wounded men from the beachheads. After this, the liner was converted and to serve as the commodore ship and joined the British Pacific Fleet at Hong Kong. After the Japanese surrender, she remained at Hong Kong as an accommodation ship for men released from war service and waiting to go home. It was estimated that during the war years, this ship transported 36,000 troops and evacuated 5,500 refugees from war zones. After the war, the Aorangi was returned to her owners and restored as a liner. It went back into service in 1948, but was then plagued by union problems among the stewards and seamen. Because of demands for higher wages, the liner operated at a loss. She continued to operate with the help of subsidies by the Australian, New Zealand and Canadian governments until June, 1953. The liner was retired that summer, taken to Scotland and scrapped.